Melissa (?) was born circa 1812 at MA.1 She married Roderick Nevers. [S406] Beulah Warner Russon, Banyan Tree, page 125. [S406] Beulah Warner Russon, Banyan Tree, Page 130. [S406] Beulah Warner Russon, Banyan Tree. [S406] Beulah Warner Russon, Banyan Tree, Page 131. [S406] Beulah Warner Russon, Banyan Tree, Page 132. Samuel and Elizabeth were enumerated in the 1920 Ashtabula, Ashtabula Co., OH, federal census. He was 55 a carpenter, she was 56. There were no children in the household. [S406] Beulah Warner Russon, Banyan Tree, Page 133. Amorett Case was born on 29 May 1791 at CT.1 She was the daughter of Timothy Case and Esther Brown.1 Amorett Case married Ira Nichols.1 Amorett Case died on 14 January 1888 at PA at age 96. [S101] Ruth Cost Duncan, John Case, Page 34. Esther Elizabeth Nichols was born on 30 January 1829 at PA. She was the daughter of Ira Nichols and Amorett Case. Esther Elizabeth Nichols married Francis Isherwood Campbell. Esther Elizabeth Nichols died on 21 March 1901 at San Diego, San Diego Co., CA, at age 72. Information on Esther and her descendants is from a web page prepared by James Dow Allen III at http://freepages.genealogy.rootsweb.com/~jamesdow/pedstart.htm accessed 11 November 2002. Francis Isherwood Campbell was born in 1820 at PA. He married Esther Elizabeth Nichols, daughter of Ira Nichols and Amorett Case. Francis Isherwood Campbell died in 1887 at KS. Emma Rosella Campbell was born on 20 October 1851 at Edinboro, PA. She was the daughter of Francis Isherwood Campbell and Esther Elizabeth Nichols. Emma Rosella Campbell married Thomas Jefferson Hudson on 5 October 1870. Emma Rosella Campbell died on 17 December 1930 at age 79. Thomas Jefferson Hudson was born on 30 October 1839 at near Jamestown, Boone Co., IN. He married Emma Rosella Campbell, daughter of Francis Isherwood Campbell and Esther Elizabeth Nichols, on 5 October 1870. Thomas Jefferson Hudson died on 4 January 1923 at Wichita, Sedgwick Co., KS, at age 83. He was buried at Fredonia Cemetery, Fredonia, Wilson Co., KS. from Kansas: A Cyclopedia of State History, Embracing Events, Institutions, Industries, Counties, Cities, Towns, Prominent Persons, etc. Forty-six years ago, in 1866, there came to Kansas a young Indiana school teacher, who, like the state to which he had come, had but entered upon an independent career and had yet to prove his merits. Kansas in the interim has achieved a remarkable record among states, and the young teacher, Thomas J. Hudson, has lived a full life, a life of honor and usefulness, which in its accomplishments has made his name stand preëminently among his fellows as a man of superior ability and intelligence. Born Oct. 30, 1839, in Boone county, Indiana, he was reared and received his earlier education in his native county. Later he was a student in the academy at Lebanon, Ind., and also attended Wabash College, at Crawfordsville, Ind., one year. He then taught several terms of school in Boone and Hendricks counties, Indiana, but in 1866 the call of the West brought him to Kansas. He taught school at Coyville, the first common school in Wilson county, and assisted in building the first school house there. After teaching one year in this state he began to prepare for law, the profession he has made his life work. After diligent reading from books furnished by Ruggles & Plumb, of Emporia, he was admitted to the bar, at Iola, Kan., in June, 1869, and immediately located at Fredonia for the practice of his profession. From that time to the present, a period of over forty years, he has been one of Wilson county's most prominent men of affairs. As a lawyer he soon displayed great aptitude and ability, rose rapidly at the bar, and early acquired a large and profitable practice, which as years have passed has extended to adjoining states. He is admitted to practice in the state and Federal courts and in the United States Supreme Court, and his clientage is a representative one. Along in the '70s Mr. Hudson was the attorney for Fredonia in the county seat contests of that period. An adverse decision from the supreme court of the state lost the first election for Fredonia, but in the meantime Mr. Hudson, with characteristic energy, set about to secure a second election, and that time he won out in the supreme court and Fredonia became the county seat of Wilson county. He was then a young lawyer, and the same energy and determination shown in that case have marked his whole subsequent career. He is a Democrat, and early in his career began to take an active part in political affairs. In 1869 he was elected to the state legislature, as a member of which body he gave his vote in favor of the adoption of the Fifteenth amendment to the constitution of the United States, that amendment giving the right of suffrage to the colored people. He served four terms as county attorney of Wilson county and an equal number of terms as mayor of Fredonia, and for several years was a member of the Fredonia board of education, of which he served as the first treasurer. While in that position he effected the sale of six per cent. school bonds at par, a transaction then unprecedented in Kansas. In 1892 he was elected to the Fifty-third congress by a majority of 2,500 votes and was unanimously nominated for reëlection, but declined the nomination. During 1897 and 1898 he was a member of the board of regents of the Kansas State Agricultural College, at Manhattan, and was its loan commissioner, in which capacity he handled several hundred thousands of dollars without the loss of a dollar. In 1908 he was the Democratic candidate for Congress, but was defeated, owing to the large Republican majority in his district. He has long been a close student of political economy and has given deep thought to many of the vital problems that confront our government. For over twenty years he has contended for such legislation, both by the National Government and the state, as would require all banks chartered by either the National Government or the state to guarantee their depositors, thus effectively preventing money panics. He has always opposed class legislation and particularly tariff laws, contending that the general government should levy instead as much tax as is necessary to meet its expenses. He has always fought graft in every form and generally at his own expense. He has long favored an amendment to the constitution, providing for the election of federal judges and United States senators. Fredonia is well favored in its railroad facilities, in the securing of which no one labored more earnestly than did Mr. Hudson. When the building of the St. Louis & San Francisco railroad was contemplated he was one of a committee of Fredonia citizens that went to St. Louis in an endeavor to persuade the capitalists of that project to build their road through Fredonia. This mission was successful, largely through the efforts of Mr. Hudson, who was spokesman for the committee. He helped to organize and served as the attorney for the local company of the Atchison, Topeka & Santa Fe railroad when that road was being built, and in a similar capacity contributed liberally of his time and means to secure the assistance of the New York capitalists in the building of the Missouri-Pacific railroad through Fredonia. He wrote and circulated the petition asking for a new court house for Wilson county, and in the litigation which followed this request represented the petitioners through each court to the supreme court of the state, where he won their cause. He was one of the organizers of the Wilson County Bank, and in connection with Isaac Hudson, his brother, built the opera house block, one of the handsome and substantial structures in the business part of Fredonia. Besides those interests he owns a fine ranch of several hundred acres near Fredonia, where he is extensively engaged in the breeding and raising of Short Horn cattle. On Oct. 5, 1870, Mr. Hudson was united in marriage to Miss Emma Campbell, of Topeka, but a native of Pennsylvania, from which state her parents, Francis and Elizabeth (Nichols) Campbell, removed to Kansas, in 1858. The father's people originally came from Massachusetts. Mrs. Hudson is a descendant on her mother's side of Peter Brown, of the Mayflower, and of Capt. John Brown, of the Revolutionary war, who was the grandfather of John Brown, of Osawatomie. Mrs. Hudson was educated at Washburn College, having been the first young woman enrolled in that institution, then known as Lincoln College. Mr. and Mrs. Hudson have two sons and four daughters—Lois (widow of the late Guy Allen), Andrew, Elizabeth, Thomas J., Blanche, and Marjorie. 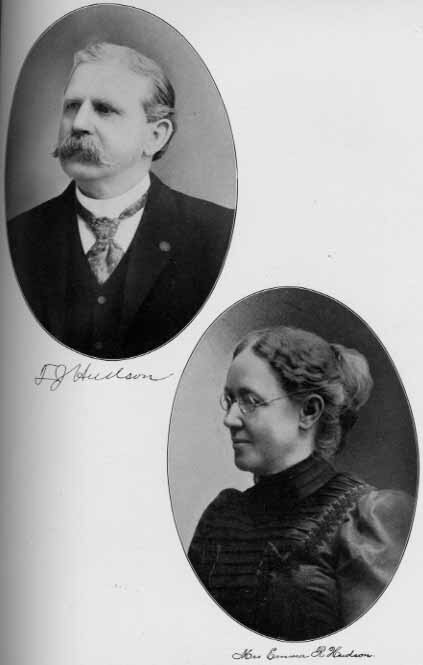 Mr. Hudson and wife are members of the Methodist Episcopal church at Fredonia, of which he was one of the organizers. Fraternally he affiliates as a member of the Masonic order, in which he has attained the Scottish Rite degrees. He is also a member of the Independent Order of Odd Fellows, of which he was one of the organizers and charter members at Coyville, and later at Fredonia. Lois Hudson was born on 28 September 1873 at Fredonia, Wilson Co., KS. She was the daughter of Thomas Jefferson Hudson and Emma Rosella Campbell. 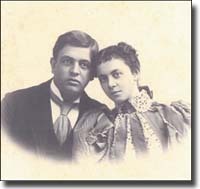 Lois Hudson married Guy Wiley Allen on 4 September 1895. Lois Hudson died on 30 July 1948 at Seward, AK, at age 74. Lois Hudson Allen's entire life was spent preparing for the publication of her only book -- "Alaska's Kenai Peninsula." The book, written in 1946, encompasses many aspects of Allen's personality and desires: a strong work ethic, the opening of the frontier, road development, agriculture, tourism and her love of Alaska. Allen's writing career started as a newspaper editor in 1915. She was a journalist with a mission to bring roads and prosperity to the Kenai Peninsula. Yet, despite her soap boxing about public issues, she never boasted about her private life. Allen was the daughter of highly accomplished parents -- particularly her father, Thomas Jefferson Hudson (1839-1923), who was active in shaping the community of Fredonia, Kan., where he settled with his wife and son after the Civil War. Beyond his many civic duties, T.J. was an outspoken Democrat in a Republican county. For a while, he owned an interest in The Fredonia Democrat newspaper and was its political editor. After his first wife died, T.J. remarried Emma Campbell in 1870. Lois, born in 1873, was the first of their five children. Kansas was fertile ground for a politically-minded young woman. Allen attended coeducational Methodist Baker University Academy of Baldwin City, Kan., and graduated from Notre Dame's St. Mary's Academy in South Bend, Ind. She accompanied her father on a trip to Utah and was his secretary while he served in the U.S. Senate. While there, she witnessed a turbulent term in Washington during the economic panic of 1893. She was married to Guy Wiley Allen, a native Fredonian, in 1895. Guy's father worked as head cashier in T.J. Hudson's Wilson County Bank. Guy was a clerk at the bank, at the time of their wedding. The Methodist ceremony was held in the Hudson home in Fredonia and included nearly 50 relatives, many of whom were community leaders. Although this was probably Fredonia's wedding-of-the-year, the review emphasized the fine character of the young couple rather than the expensive trappings and gifts. The wedding was followed by a honeymoon train ride aboard T.J. Hudson's Frisco line to Colorado, where they went to sightsee and visit relatives. The couple had three sons -- Guy Hudson in 1896, James Dow in 1900 and Frank Wiley in 1901. Soon after Guy was elected to head bank cashier, his health started to fail. He died in early 1908, leaving Allen, then 34, pregnant with their fourth son, Andrew. However, given her family's position, it is unlikely she endured great economic hardship. It's likely she did more secretarial work for her father or lent a hand at the local newspaper. In 1912, when Allen was 39, Kansas men granted women the right to vote. Allen probably was delighted to have gained suffrage. She eventually left the security of Fredonia and sought a frontier of her own. She moved to the picturesque Pike's Peak region of Colorado and became a journalist. Colorado was another progressive state where women could vote, and journalism was a way a spirited woman could influence history. Allen applied for a job with a Colorado Springs newspaper but was turned down because she was a woman. Convinced she could do the job, she showed up at the office every day and worked as if she was employed there until the editor was so impressed with her skill and persistence that he hired her. Allen purchased her first newspaper in 1915, and her sons helped. She favored small towns, where she believed she could make a difference. However, it was difficult to make a living, let alone support a family, on revenues from a small-town weekly paper. At each of her five Colorado papers, which she owned between one and seven years each, she set the gender neutral name L.H. Allen on the masthead. Editorials were written using the pronoun "we," even when she was the entire staff. And if she mentioned herself at all, it was in the third person as Mrs. Guy W. Allen. She learned her craft well. Her papers were typeset, and at least two newspapers featured photographs. Allen learned how to keep enough controversy in the paper to attract readers. She relied on humor to avoid offending local individuals, so as not to lose customers and advertisers. She was a populist. Her sermon-like editorials often appeared on the front page and were meant to sway the opinion of the average person. In 1920, her peers elected her to be the first woman president of the Colorado Press Association. Allen's first paper, which she owned for only one year, was the Manitou Springs Journal. The mineral waters of Manitou Springs had drawn tuberculosis patients for decades and were starting to attract short-stay tourists. The resort town had a large population of doctors and visitors, including suffragettes, artists, politicians and society people. One feisty Allen editorial told her neighbors to quit criticizing those who made money off the mineral water and start their own water business. She attempted to make the Journal a daily paper, but the small town could not support it. Her second paper was the Fremont County Leader in Canon City, a breathtaking destination for motor-tourism with the economic stability of a large state prison. Canon City was near the famous gold mining district of Cripple Creek. Allen published and edited the Canon City paper from 1916 to 1921. But the years were not totally happy. Allen's son Andrew died of the flu during an 1918 epidemic. She moved to Pueblo in 1922. There she published the Pueblo County Democrat for one year and managed the Allen Printing Company. Her father died in 1923. Sometime after that, Allen moved to Colorado Springs. Her next newspaper was published during the Depression in 1933. She briefly owned and edited the Colorado Springs Independent. She published the Colorado Springs Shopping News in 1934 in an attempt to stimulate the local economy. The Great Depression may have reduced Allen's financial state, but not her drive. Allen became aware she was suffering from breast cancer. Taking charge of her health, she wrote the Mayo Clinic and followed its advice in growing her own penicillin. She did not want to be a burden to her sons and their families, so she considered moving from Colorado. Alaska appealed to her. It sounded like a new frontier. Allen wrote to the governor of the Alaska Territory, asking him which community needed a newspaper. The governor suggested Skagway. Allen packed up a typewriter and mimeograph machine and moved north. Skagway had dwindled to fewer than 500 people. The townspeople were struggling financially and were largely dependent on steamship tourists curious about the faded Klondike Gold Rush. She published the weekly Skagway Cheechako out of her home from 1936 to 38. To a 1930s' audience, the mimeographed pages and her new use of contractions and tolerance for spelling errors gave the paper a modern look. After her typewriter was shipped stateside for repairs, she even hand wrote one issue. Issues included tidbits about Washington, Hollywood and Europe, along with local stories. In one article, Allen reported that Alaska Nellie Neal-Lawing was traveling Outside to seek a publisher for her autobiography. To Allen, Neal-Lawing's Moose Pass must have sounded like the ideal small town of the verge of growth, because she moved there. She sailed from Skagway to Seward and journeyed north by train. Allen stayed at either the Lawing Roadhouse or Heilo's Roadhouse before purchasing a small house next to the post office. From 1938 to 1942 she published the mimeographed weekly Moose Pass Miner and sold it from her home. The masthead declared it was "Devoted to the Interest of Moose Pass and Kenai Peninsula." Allen was interested in the entire peninsula, but it is unlikely the market for her paper ever extended outside of Moose Pass. Seward and Seldovia already had their own papers. The road from Seward to Hope was poor, and there was no road from Cooper Landing south. Moose Pass tourism was small, but elite. Wealthy big game hunters stayed for extended visits. Train tourists stopped on their way to Mount McKinley and Circle Hot Spring. Roadhouse owner and self-promoter Alaska Nellie was the only other woman of Allen's generation. Neal-Lawing was the same age, a Missouri farm girl, and a former Cripple Creek boardinghouse owner. Their similarities in background were as striking as their differences in personal style. News of Neal-Lawing appeared frequently in Allen's paper, but they are not remembered to have been friends. In 1938, the Depression was waning and Moose Pass looked like a community with a future. Allen set about to promote the town's growth by advertising and reporting on various organizations and merchants. She reported on the Road Commission, Alaska Rail-road and Forest Service hirings. She touted the value of New Deal Programs that benefited Alaskans. She chastised her neighbors for ordering supplies from the Lower 48, rather than buying from Moose Pass merchants. She faulted the city of Anchorage for promoting a train tunnel to Whittier, when Seward was the key port. She accursed the Anchorage paper of falsifying the results of a poll that claimed that there was popular support for a Whittier tunnel. She scolded Washington for appointing a non-Alaskan to the position of territory governor. She faulted the U.S. government for spending tax dollars for the Alaska Highway on Canadian soil, while Alaska was road poor. She published the entire poem from the base of the Statue of Liberty, and then proclaimed that Alaska should open its door to European war refugees. The Moose Pass Miner reported on the worsening condition in Europe, the news sometimes coming from European guests of Lawing Roadhouse. But light, local news predominated. Allen's Moose Pass Miner provided only a small income. A few issues were late because orders of paper had not arrived on the train in time. She did offer to trade subscriptions for firewood. For additional income, she offered her secretarial skills for hire and stationary for sale. In addition, she published four articles in the new magazine, The Alaska Sportsman. The articles were on industrious Alaska ventures like: Neal-Lawing's roadhouse in "Woman Unafraid," Russell Williams' and Oscar Christensen's fur farms in "Mink Rancher" and "Trail Lake Fur Farm," and the Matanuska Colony in "Matanuska Gets Down to Business." However, eventually Alaska, along with the rest of the nation, began preparing for war. Tourism ceased and mining was closed down by the federal government, leaving many Moose Pass residents without income. But Army jobs in Seward and Anchorage were plentiful and paid well. Although Allen was sympathetic to the war effort and her office skills would have earned her a job in Seward, she still preferred living in small towns. The abundance of high-paying Army jobs forced the territory to relax the rules on teacher qualifications and issue many temporary emergency permits. Allen was a firm believer in public education, so in 1942 she took a teaching position in Ninilchik. She was 69 but claimed to be 64. She taught in Ninilchik for one year. The 1913 schoolhouse sat on the hill next to the Russian Orthodox Church. The two-classroom Ninilchik Territorial School served fewer than 30 students from grades one through eight. It is likely Allen taught the elementary class and lived in the attached teacher's apartment. Her duties would have included teaching the sewing class and directing the eighth-grade newspaper. The school's mimeographed monthly was the community's sole paper. During this year in Ninilchik, the germ of a book about the Kenai Peninsula already may have been forming in Allen's mind. She took her notebook and camera on trips to Homer, Kasilof and Kenai. She did not commit herself to a second year of teaching, saying she was in poor health. She moved to Hope. Hope storekeeper George Roll had died in 1941, and in 1943, his widow Louise Roll was willing to sell their home and garden. The little house on Main Street had been built by the Alaska Commercial Company in 1897. The old paper insulation had settled between the walls, and Louise did not like the winter coldness. But Allen probably believed she was buying Eden. The windows of her new home looked out on Turnagain Arm and Resurrection Creek. Although of retirement age, Allen was not one to slow down. She set to work on her book. She read Alaska history books and took pictures around Hope. She wrote the text in an informal style and used a polished layout with many small photographs that she borrowed from members of the Hope community. She contracted a Denver printer, ordered 4,000 copies and mailed him a check for $275. She was counting on having the book titled "Alaska's Kenai Penin-sula," which would be the first peninsula tourist guide, available for sell for the 1946 Christmas season. But a dock strike delayed delivery. When she finally received the books, it was too late for Christmas marketing, so she advertised the book in The Alaska Sportsman in 1947 and it sold at newsstands and Seward's Alaska Shop. It was well regarded in Hope, Moose Pass, Ninilchik and other small towns that lacked newspapers. It promoted homesteading, economic prosperity and road construction. The book gives a strong sense of how things were in small towns in 1946. Its greatest fault is in Allen's lazy historic research. She tolerates misspelled names, and her chatty style leaves historians a bit confused. At this point, her health was failing and she slowed down on marketing efforts. But she continued to garden and cook. She helped out when the community cleared the Hope airstrip in 1944, but she did not attend Hope activities with any regularity. Allen's long fight with breast cancer impressed the few women and girls in town, particularly her nurse, Emma Clark, a graduate of Seattle's Swedish Hospital School. Allen died at the Seward Hospital July 30, 1948, at age 74. She was buried in Hope. Pastor Bertha McGhee returned from Seward to preside over the funeral service. Dennie McCart made the gravestone, depicting a lone figure on snowshoes. Earlier, Allen had subtracted five years from her age, and that erroneous birth date is on her gravestone. Allen, or a friend, saw to it that the Seward Polaris and Kenai Peninsula-Aleutian Chain News had the names and locations of her sons and siblings. Her two living sons, Hudson and James, were in Denver where James still worked in the newspaper trade. Coincidentally, one of her six grandchildren, Kim Allen, later became a newspaper editor herself. The Wilson County Citizen in Kansas featured a front-page obituary detailing the remarkable accomplishments of the "well-known Wilson County woman." Allen had set out to shape history, and she succeeded on Alaska's Kenai Peninsula. Guy Wiley Allen was born on 8 December 1872 at Buffalo, Wilson Co., KS. He married Lois Hudson, daughter of Thomas Jefferson Hudson and Emma Rosella Campbell, on 4 September 1895. Guy Wiley Allen died on 18 January 1908 at Fredonia, Wilson Co., KS, at age 35. Guy and Lois were enumerated in the 1900 Fredonia, Wilson Co., KS, federal census. He was a bank clerk, age 27, she was 26. The only child in the household was G. Hudson, 3. Lois was enumerated in the 1910 Colorado Springs, El Paso Co., CO, federal census. Children in the household were Hudson g. 13, James D. 9, Frank W. 8, and Andrew 2, all born in Kansas. James Dow Allen was born on 6 July 1900 at KS. He was the son of Guy Wiley Allen and Lois Hudson. James Dow Allen died in February 1986 at Denver, Denver Co., CO, at age 85.